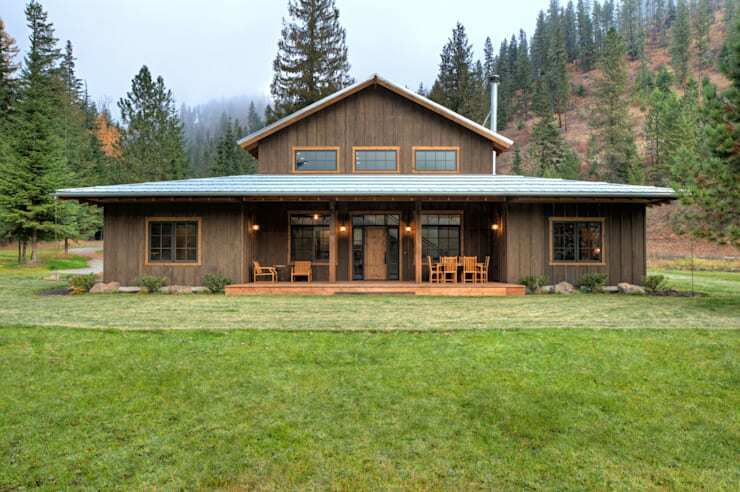 This homify tour explores a countryside ranch located in the state of Idaho. Nicknamed the Lucky 4 Ranch , the home has been built in a clearing in the woods, using wooden planks in a traditional cabin style. This peaceful and natural home offers a spacious interior that acts as a welcome sanctuary among the dense pine forest that surrounds it. Designed by the architects from Uptic Studios in Spokane, Washington, this family residence achieves a superb balance between modern luxury and warm, rustic comfort. Built in a true ranch style, this home instantly transports you to the days of cowboys, rolling prairies, and boot spurs! The friendly facade is stunning in its balanced symmetry, and the cheerful wooden furniture resting on the front porch turn this home into a welcoming place, right off the bat. 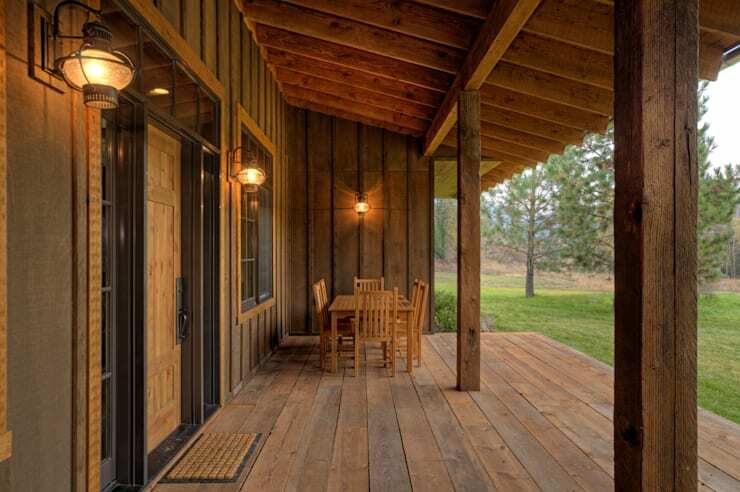 You can simply imagine how beautiful it would be to enjoy a glass of wine or a morning coffee as you overlook the misty meadow that extends from the home's low-lying front porch! With a small second floor and large ground floor plan, the lower half has been designed to contain the living room, garage, front terrace, kitchen, dining room, bathroom and a bedroom. The upper section enjoys privacy as a master bedroom. Throughout the home, you'll notice how the architects included plenty of windows that offer views of the beautiful scenery, in addition to flooding the interior with light. 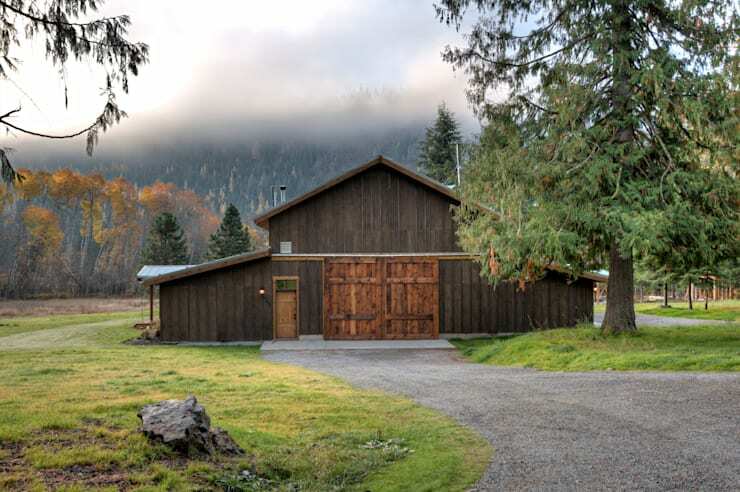 Here, the architects have elaborated on the countryside ranch theme by turning the modern and spacious garage into a stable. They've done this by replacing the typical plastic siding and automatic garage door with a heavy wooden door reminiscent of a traditional barn door – very in keeping with the rest of the home's ranch appeal. From this angle, it’s possible to fully appreciate the true scale of the home and admire it framed against the misty pine trees and steep mountains in the distance. The front porch reflects the house’s traditional heritage; this warm wooden porch would almost have you convinced that you've travelled back in time to the turn of the 20th century! Covered with an awning that provides shelter from rain, the beams, roof, floors, walls, doors and furniture of this open porch are all of the highest quality woods. They're sure to be well-preserved by the generous overhang of the ceiling above, making for an excellent place to sink into nature, enjoy the sound of crickets, and have a friendly conversation with guests around the table. This neutral-toned living room provides the perfect balance between spacious and cozy! Although there's plenty of negative space filling the upper area of the room, this living room remains grounded by the sturdy design of its furniture and soft woven rugs that anchor them to the floor. 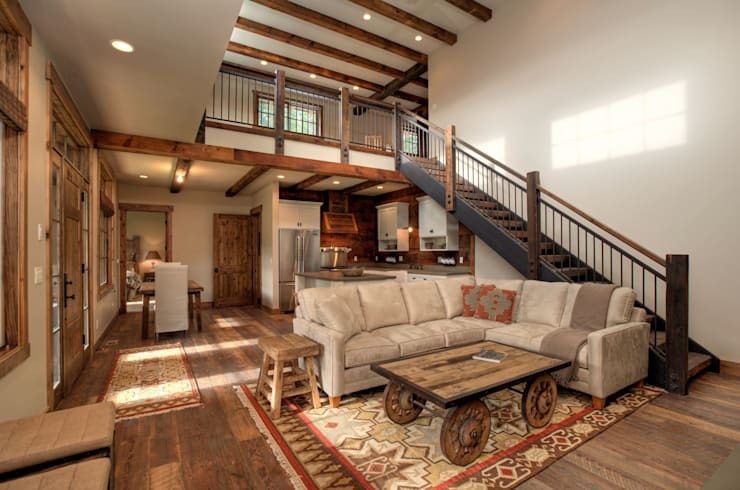 As a whole this modern lofted design speaks to the modern times, the addition of rustic and antique furniture (like the old cart that's now re-purposed as a coffee table) bring this home back to its country origins. A far cry from the glistening and polished kitchens of a modern urban home, this ranch kitchen instills a sense of natural comfort and accessibility. The black-on-white cabinetry may be brand new, but the black handle on white wood has been a classic for decades, bringing a sense of historic charm to the space. Likewise, they've opted for a farm sink that employs the typical look of an exposed ceramic rectangular basin. 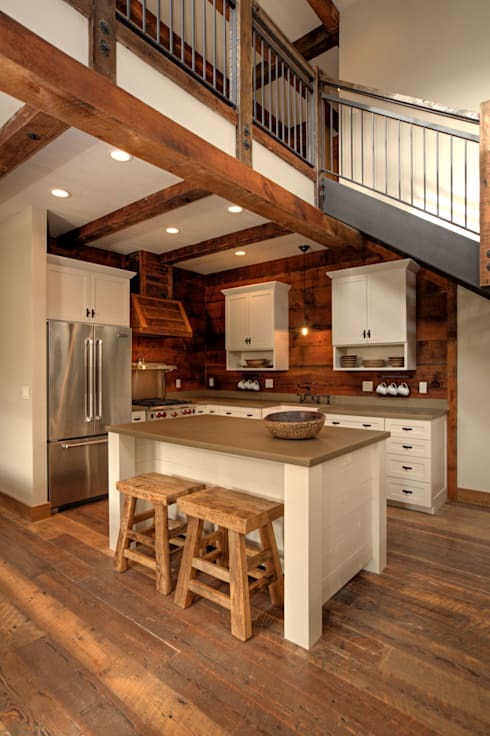 Additional warmth is found in the raw wooden texture and varied natural browns of the floor. 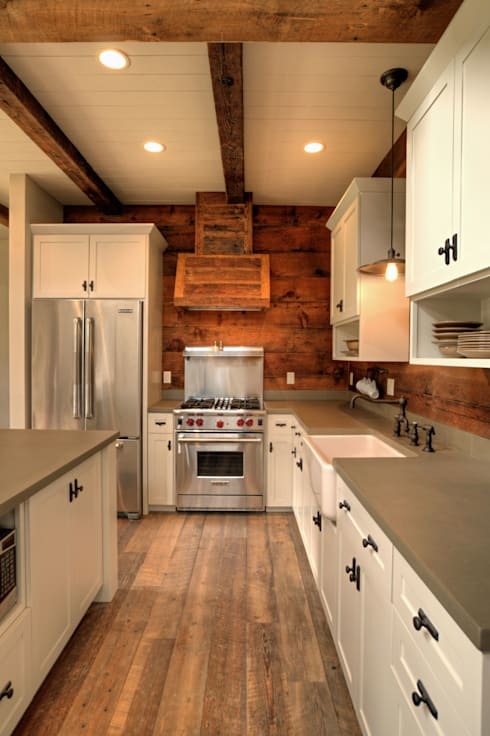 To balance this rustic look, the designers have finished this kitchen with stainless steel appliances, turning the kitchen into a modern space that's convenient to keep clean! All over, this home exudes a sense of, well, sense. Everywhere you look, the home's design has been made to favor comfort, practicality, and convenience, and this kitchen is proof. The location of this kitchen allows the living room to enjoy the high ceilings of the central part of the room, creating a comfortable nook under the stairs where the scale is more appropriate for a kitchen. Often the room that experiences the most coming and going throughout the day, the kitchen has been located close to the stairs, and within a few strides of both the living room and the dining room areas (all laid out in an open-concept style). The lofted area outside of the master's bedroom enjoys a lighthearted and sunny location close to the many windows that line the upper edge of the home, a perfect spot for a reading a good book on the sofa, doing a bit of work at the chair and desk, or setting up a board game on the coffee table. 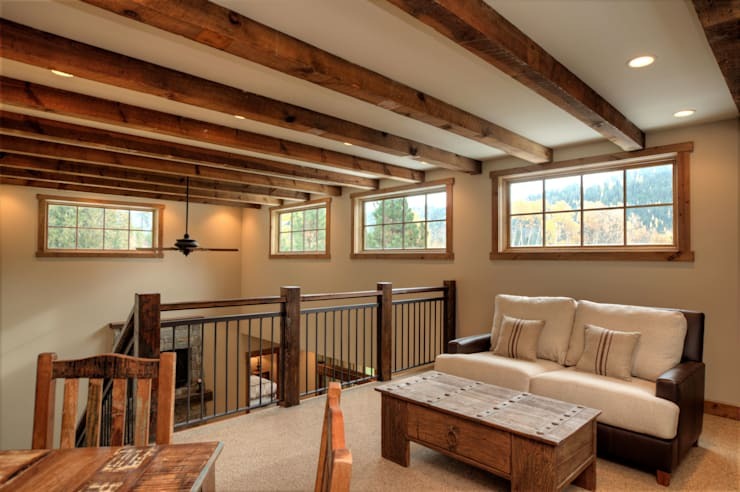 This lofted area also allows you to further explore the strong square beams that support the roof of the home, exposed in a style that's reminiscent of an old country inn. If you liked this tour of a rural (yet modern!) ranch, you'll like this tour of a wooden home that sits camouflaged in the forest! What you do think of this country home? Share your thoughts below.